3D Printing and Rapid Prototyping. The process of FDM 3D printing is a additive manufacturing process that uses precision computer generated tool paths to bond layers of extruded liquified plastic one on top of the other to create any shape desired with a high level of strength and accuracy. With our new Fortus large capacity FDM industrial printer we can offer our customers hi end real world Rapid Prototypes and Tools. With a build chamber of 16” X 14” X 16”high we can accommodate most customer requests in one build cycle. Large jobs can be sectioned into individual builds with the help of computer generated split lines and built in adhesive clearance to retain accuracy. With the flexibility of ABS plastic or the ultimate strength of Polycarbonate customers can choose the material that best suit there application. As a top of the line production printer the Fortus machines offer a +/-.005” tolerance. Low run end use parts are considered highly cost effective and lead time friendly compared to traditional manufacturing methods. Jigs and fixtures – Why invest in heavy, expensive jigs and fixtures that require assembly when you can build fixtures in one piece using FDM. And because they’re made of thermoplastics, they’re easier on employees, too. Marketing tools – Need to show your new concept to create a buzz? Build a Dependable Industries rapid prototype. You can paint it, plate it or just simply show it. Production mockups – Get a highly accurate and functional rapid prototype to ensure that your design is correct before investing in production. 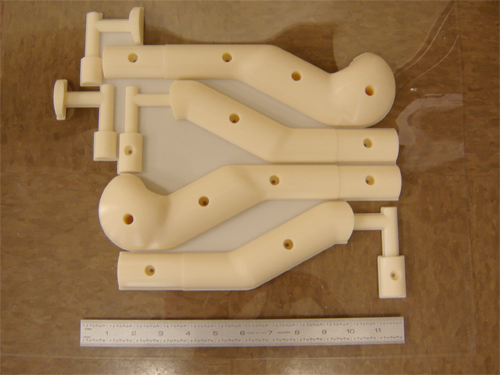 Thermoforming – Use thermoforming as an inexpensive alternative to plastic molding or other forming methods. Direct to tool Patterns, molds and tools. With the design help of our Patternmakers and tooling designers we can turn around production tooling straight from the FDM printer. Patterns for sand casting, thermoforming tools, urethane casting, investment casting and more can be made in days and not weeks.